The new food blog Spoon Fork Bacon is a delicious feast in itself. The photography is top notch, the styling inspired, and each post sprinkled with complementary design elements. First on my list to try out are the grilled zucchini tacos, the spinach and ricotta stuffed shells, and the simple blackberry jam. Served up with a kiwi capiroska or sweet cherry gin and tonic. Images courtesy of Spoon Fork Bacon. Photography by Teri Lyn Fisher and styling by Jenny Park. grijs has grown on me. For a daily dose of love, the photoblog Urban Love Daily posts images of found objects that resemble a heart or love in some way. 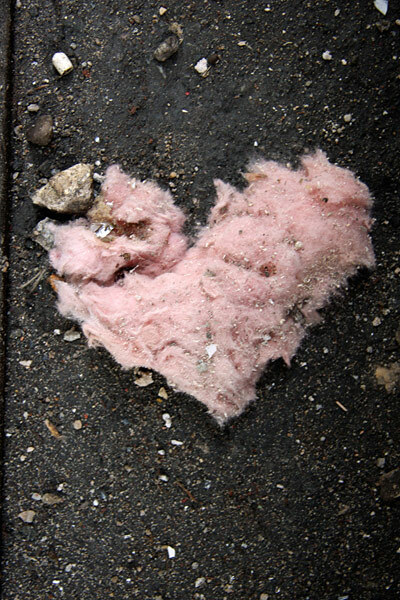 Like this heart-shaped piece of insulation on the street. 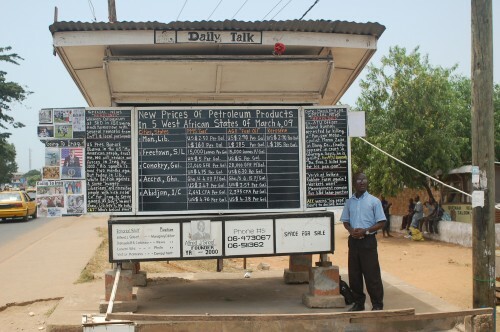 In Monrovia, Liberia, Alfred Sirleaf runs the Daily Talk, a news and information service that uses a blackboard display to show the daily headlines. Volunteers across Liberia send updates to Sirleaf, which he then presents to the public. The chalkboard news feed brings information to people like refugees who want to participate in their local and national community, but don’t have the means to stay informed. For those who cannot read, he uses symbols and pictures to get the message across. His long-term goal is to decentralize the Daily Talk and make the information available in other cities across Liberia. I was reminded of Sirleaf during the final weeks of the World Pulse Voices of Our Future program, which trains women to use social media for citizen journalism. His motivation to inform society about the news that affects them resonates with the ideas presented in the article ‘The Power of Information‘ by Gertrude, a correspondent from Zimbabwe that I had the opportunity to work with during the program. Gertrude wrote about the need for information across her country, interviewing the elder Gogo Moyo from the remote village of Binga. ‘Despite all the colourful speeches that we hear from politicians during election campaigns, we are in actual fact cut off from the rest of the world. There are no schools nearby, the roads are poor and we have no clinics. We have no access to local radio and television. We do not know why we have to vote and the effect of that vote,’ adds Gogo Moyo. The people of Binga do not want to be only recipients of news. The little exposure they have had with the media has made them appreciate the power of information and the positive change that it can bring. There is therefore an urgent need to build local capacities and abilities of marginalised and vulnerable groups in the strategic and creative use of communication to express their needs, to make their voices heard, to manage their own communication, and to participate fully in their own development and bring about long-term social change. Jonathan Harris and Sep Kamvar, the creators of We Feel Fine, have announced the completion of the book We Feel Fine: An Almanac of Human Emotion heading to stores on December 1. The book chronicles the mission of the project: to aggregate the range of emotions expressed in blogs online and collectively present them for exploration. The 288-page book contains photographs from over 1,000 individual bloggers, statistics from over 13 million individual feelings, hundreds of infographics, dozens of back stories and in-depth profiles, and countless insights into the ups and downs of everyday life. The book can be pre-ordered on Amazon.